Thorn was relatively late offer a 1000W SON, its first model being launched between 1973 and 1977, available only in a diffuse ellipsoidal bulb for high bay floodlighting. 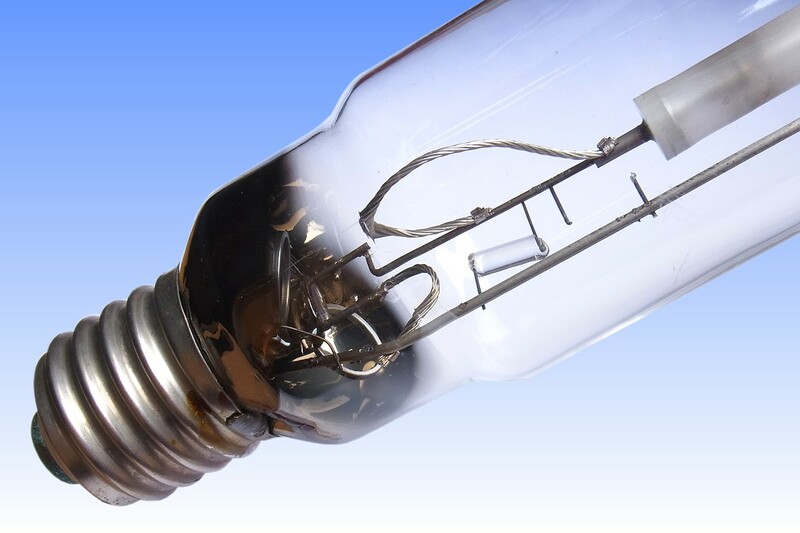 The earliest lamps may have been sourced from a competitor, but own production had begun by 1981. In 1983 the range was extended to include a 1000W clear tubular variant. 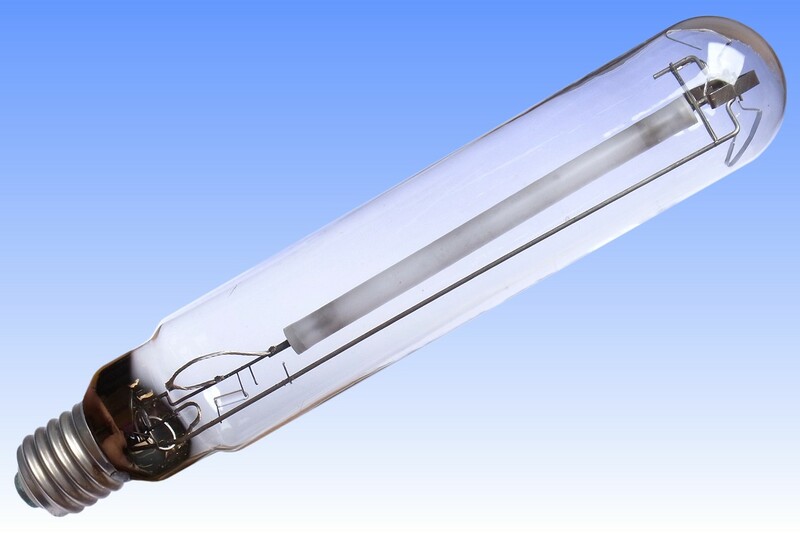 This lamp is representative of the company's 2nd generation 1kW SON-T, and features a type of arc tube seal pioneered by Thorn in which the diameter of the niobium tubes is reduced far below that of any other competitor. This reduces seal stresses to minimise risk of leaks, while also bringing a small cost advantage. The arc tube is a 3-piece monolithic construction, and employs so-called 'adaptor caps' - small PCA bushes frit-sealed to the arc tube, which reduce the diameter of the larger end openings to accommodate the narrow bore niobium tubes. 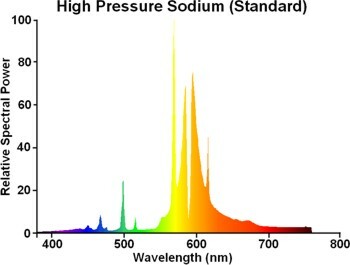 It is also notable that the thickness of the end plugs is much less than competitive lamps, which may also have helped to reduce stresses along the length of the seal. The electrode insertion depth has been set by crimping the niobium tube to slightly increase its diameter at the desired point. 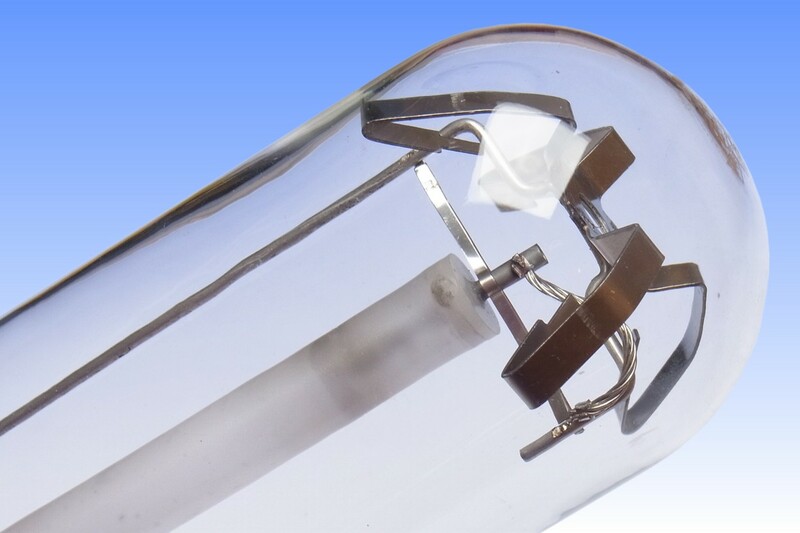 The arc tube is mounted on a resilient frame of nickel-manganese wire supported at the dome of the bulb with the same top clip as used on the company's low pressure sodium lamps, and at the lower end by a pair of glass bridges. The neck of the bulb has been pre-constricted by hand, enabling a non-skirted GES cap to be used. The seal bears a moulded thread onto which the cap has been screwed, this being locked in position by injecting a small quantity of solder into a groove moulded in the glass. References: 1) Thorn Lighting Comprehensive Catalogue, UK, 1973 - 1000W SON not yet included. 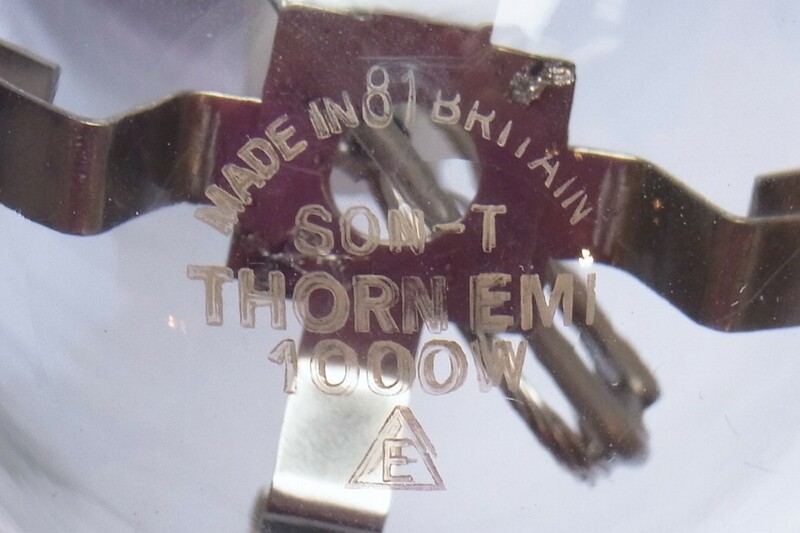 2) Thorn Lighting Comprehensive Catalogue, UK, 1977 - earliest reference to a Thorn 1000W SON. 3) Thorn Lighting Comprehensive Catalogue, UK, 1987/88. 4) Thorn Lighting Brochure, Discharge Lamps, Publication 44748, 1989. 5) Thorn Lighting Price List, 7th November 1988. 6) Thorn Lighting Product Data Sheet 1kW SON-T 96-2065A, 1-1-1983. 7) Thorn Lighting Product Data Sheet 1kW SON-E 96-0165A, 3-4-1981. 8) Thorn Lighting SON Manufacturing Specifications.